1. Open the Quick Panel by swiping two fingers slightly apart from the top of the screen to the bottom. 2. Touch the Wi-Fi icon to turn it on or off. When Wi-Fi is on the device will scan for and automatically connect to any previously connected access points, commonly known as the network. 4. Under Wi-Fi networks, touch the network you want to connect to. 5. Enter a wireless password, if necessary. 4. Scroll down to and touch Add Wi-Fi network. 5. Enter the Network SSID. This is the name of the network you are connecting to. 6. Select the Security level of the network. If you select a security level that does not match your access point, you will not be able to connect. 7. If the network is secured, you will also need to enter the password. 8. Touch Connect to store the new information and connect to the network. 4. Touch More options > Advanced. • Passpoint: Connect to passpoint-enabled Wi-Fi Access Points automatically. 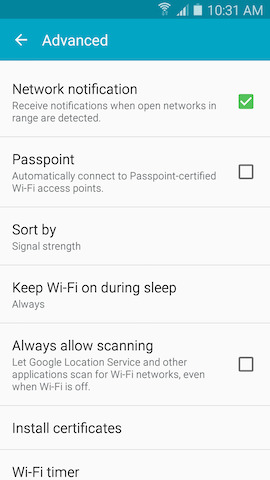 • Scan: Start another scan for nearby Wi-Fi networks. • Wi-Fi Direct: Touch Wi-Fi Direct to turn on the feature and connect to available Wi-Fi Direct devices. Wi-Fi Direct enables Wi-Fi devices to connect to each other directly (or to a group of several devices), allowing you to quickly and easily share content. • Advanced: Cutomize Wi-Fi settings. 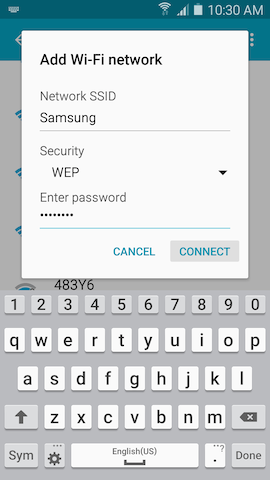 Note: To use WPS, your product must support WPS and be compatible with WPA security. 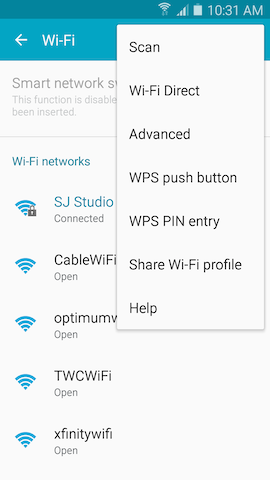 • Share Wi-Fi profile: Share Wi-Fi profiles you have created with others. • Help: Learn about setting up and using Wi-Fi networks, and other settings. Your device is compatible with 5GHz quad-band processor technology. How to transfer data from my Google™ Account on my Galaxy S5 to NFC compatible device?